Although recent advances in the medical and surgical treatment of spinal lesions have led to better outcomes, adhesive arachnoiditis is still one of the most serious conditions. Adhesive arachnoiditis may result in the formation of syringomyelia or myelomalacia, causing neurological deterioration such as sensory disturbances in the extremities, urinary disturbance, or sexual dysfunction, all of which affect activities of daily living (ADL). Various surgical procedures, including cerebrospinal fluid (CSF) shunting or subarachnoid reconstruction, are available. ,,, Shunting of CSF from the syringomyelia to the subarachnoid, pleural, or peritoneal space has been proposed to resolve the propagation of the syringomyelia or myelomalacia, but the effect of the procedure is not long lasting and revision surgery is needed rather frequently. ,, Surgical outcome may be limited by the high rates of neurological recurrence. Microsurgical dissection of the arachnoid adhesion, with decompression of the subarachnoid space, is another approach and may achieve better and more long-lasting outcomes in selected cases. A clear indication as well as surgical procedures that take into account the underlying pathophysiology are absolutely necessary. Here, we emphasize the importance of imaging diagnosis of focal adhesive arachnoiditis of the spinal cord and describe the surgical technique of microsurgical arachnoidolysis to mobilize the spinal cord and reconstruct the CSF pathway. Between January 2008 and the present, four consecutive patients with symptomatic syringomyelia or myelomalacia caused by focal adhesive arachnoiditis underwent surgical treatment at the Osaka City University Hospital [Table 1]. The four patients satisfied our inclusion criteria, i.e., (1) medical history of spinal trauma, surgery, or infection; (2) clear symptoms and objective neurological deficit; and (3) clear MRI visualization of syringomyelia or myelomalacia with the suggestion of focal adhesive arachnoiditis. Patients with spinal cord tethering alone were excluded from this study. Assessment of the the clinical condition before and after surgery was based on the modified McCormick ADL grading system and the sensory scoring system [Table 2]. An MRI study was conducted in each patient before surgery in order to carefully analyze the location and distribution of the adhesive arachnoiditis. The focal adhesive lesion was assessed using constructive interference in steady-state (CISS) MRI or myelographic MR imaging using true fast imaging with steady-state precession (TrueFISP) sequences. Based on the preoperative assessment, surgery was indicated in these patients with syringomyelia or myelomalacia caused by focal adhesive arachnoiditis. Patients were examined 3 months after surgery for clinical and radiological assessment, of improvement and were then followed up at regular intervals. The patient was placed in the prone position under general anesthesia. The patient's thorax was elevated 15° and the position of the head was maintained using three-point head fixation to prevent inadvertent cervical flexion and pressure on the face. All pressure points were securely padded to avoid any venous congestion or peripheral nerve injury. Somatosensory-evoked potential (SEP) or motor-evoked potential (MEP) monitoring was applied in case the patient developed significant myelopathy. Trains of transcranial electrical stimulation over the motor cortex were used to elicit MEPs from limb target muscles. The tibial or median nerve was stimulated to record SEPs. The operation was paused in every case when there was significant SEP or MEP changes. Surgical exploration took place at a minimum of four or five spinal levels, with the arachnoid adhesive lesion in the center of the surgical field. The dura mater was incised carefully so as not to injure the arachnoid membrane until normal arachnoid tissue and spinal cord appeared [[Figure 1]a]. The arachnoid membrane was first opened rostral and caudal to the lesion to secure the normal subarachnoid layer. The arachnoid dissection was started on the dorsolateral side of the spinal cord with resection of the dentate ligament at all exposed levels [Figure 1]b-c]. The thickened arachnoid tissue around the nerve roots in particular was dissected as far as possible to mobilize the spinal cord. The thickened arachnoid tissue was removed or resected, not in an en bloc fashion but fragment by fragment, so that some fragments of the thickened arachnoid tissue were left behind on the dorsal surface of the spinal cord. Next, a ventral dissection was started from both sides, with avoidance of excessive manipulation of the spinal cord [Figure 1]d-e]. Gentle mobilization of the spinal cord made ventral dissection of the adhesions possible. The procedure was continued from both sides. At this stage, the ventral dissection was finally accomplished and pulsatile movement of the spinal cord could be visualized [Figure 1]f]. In all cases, a small rubber sheet was introduced on one side, passed below the spinal cord, and removed from the other side to ensure that the spinal cord was completely mobilized. 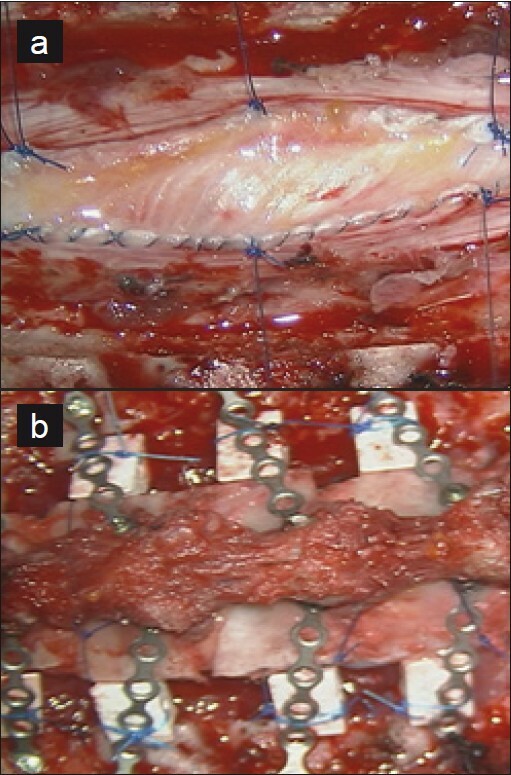 After the dura mater and spinal cord were free from adhesions, an expansive dural plasty was performed using autologous fascia lata [Figure 2]a], followed by an expansive laminoplasty of the lift-up style [Figure 2]b]. , No shunting procedure was added to this procedure. Figure 1: Intraoperative photographs showing the surgical steps of the microsurgical arachnoidolysis in the procedure in case 1. (a) Dural opening revealed the adhesive arachnoid membrane around the spinal cord. (b) Higher magnifi cation of the boxed area in a revealed the thickened arachnoid tissue on the dorsolateral side of the spinal cord. (c) The dentate ligament at all exposed levels was resected. (d) and (e) A ventral dissection was started from both sides with avoidance of excessive manipulation of the spinal cord. (f) The pulsative movement of the spinal cord was visualized at the fi nal step. Figure 2: Intraoperative photographs showing the dural plasty using autologous fascia lata (a), which was followed by expansive laminoplasty of lift-up style using hydroxyapatite laminar spacers (b). All four patients presented with initial symptoms of sensory disturbance, such as dysesthesia (three patients) or hypalgesia (one patient). The interval from the initial onset to surgery ranged from 2 to 18 years (mean, 9.5 years). The presumed etiologies of spinal adhesive arachnoiditis were infection in one patient and trauma in three patients. A clinical summary of the patients with focal adhesive arachnoiditis of the spinal cord is presented in [Table 1]. Syringomyelia or myelomalacia caused by the focal adhesive arachnoiditis was demonstrated by MRI. The focal adhesive lesion was assessed using CISS image or myelographic MR imaging with TrueFISP [Figure 3]. In all patients, a focal adhesion could be discerned at a cervical or thoracic level [Table 1]. No patients showed tonsillar herniation or hydrocephalus in this series. Follow-up periods after surgery ranged from 5 months to 32 months. Two patients showed modest or minor improvement in neurological function (cases 1 and 3), while two patients (cases 2 and 4) were unchanged, although the extent of the syringomyelia or myelomalacia was clearly decreased soon after surgery in all cases [Figure 4]. No recurrence was noted within the follow-up period. Follow-up results are presented in [Table 3]. Figure 3: In case 2, serial myelographic MR imaging with TrueFISP at the level of the old spinal cord injury obtained before surgery suggests that the adhesive arachnoiditis was restricted to the injury site. Case 3 : A 36-year-old male had been involved in a high-speed motor vehicle collision 2 years before. The patient was paraplegic and had undergone posterior surgical fixation of the thoracic spine. He was referred to our institute because of the gradual onset of sensory loss in the upper extremities, which had developed gradually after the traffic accident. Neurological examination on admission revealed severe hypalgesia in both upper extremities and complete paralysis below the injury level. MRI revealed the old damage of the spinal cord at T5, and diffuse extension of syringomyelia up to C4 [Figure 4]e]. Axial CISS images suggested the presence of focal adhesions on the ventral side of the spinal cord at the level of the old spinal cord injury, as the subarachnoid space on the ventral side was absent, with distortion of the spinal cord itself [Figure 5]. The patient underwent microsurgical arachnoid dissection to mobilize the spinal cord and reconstruct the CSF pathway. Following surgery, gradual improvement of sensory function in both upper extremities was noted. MRI obtained soon after surgery revealed complete disappearance of the syringomyelia [Figure 4]f] and satisfactory expansion of the dural sac at the local site. During the follow-up period of 20 months, there was no neurological or radiological recurrence. Figure 4: T2-weighted MRI obtained before surgery (a, c, e, and g) and late after surgery (b, d, f, and h) in all cases. a and b: case 1; c and d: case 2; e and f: case 3; g and h: case 4. Figure 5: In case 3, serial axial CISS imaging at T4 (a), T5 (b), and T6 (c) obtained before surgery suggests that the focal adhesion is on the ventral side of spinal cord at the level of the old spinal cord injury (T5). 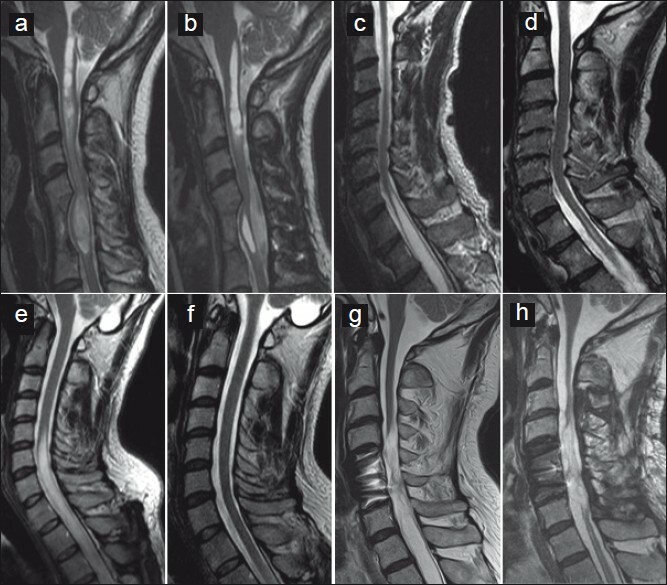 Arachnoiditis can cause progressive syringomyelia or myelomalacia due to a tethering effect on the spinal cord, with consequent altered CSF dynamics. ,,,,,,,,,,, Basic studies suggest that spinal tissue scarring at the injury site may cause a tethering effect on the spinal cord, which may lead to significant alterations in the spinal cord parenchyma. Altered CSF dynamics may also be a causative factor. It is speculated that the rostrocaudal CSF pulse wave is misdirected into the spinal cord parenchyma. The resulting high intramural pressure and decreased compliance of the subarachnoid space favor the flow of fluid into the spinal cord, possibly through perivascular spaces, resulting in a destructive cavitation process and eventually the formation of a syrinx cavity. ,,,, Causes of altered CSF dynamics in the spinal subarachnoid space include adhesive arachnoiditis secondary to hemorrhage, infection, trauma, radiation necrosis, ischemic infarction, or surgery. In the present case series, the surgical procedure of microsurgical arachnoidolysis was indicated only when focal adhesive arachnoiditis was detected on MRI using CISS imaging or myelographic MR imaging with TrueFISP. CISS imaging was first introduced in 1993 by Casselman et al. CISS imaging is helpful to identify the neural structures within the subarachnoid space and is the sequence of choice for the preoperative diagnosis of trigeminal neuralgia, aqueductal stenosis, or brachial plexus lesions. ,,, Myelographic MRI with TrueFISP was first reported in 2003 by Baskaran et al. and can provide superior assessment of spinal anatomy and abnormalities. 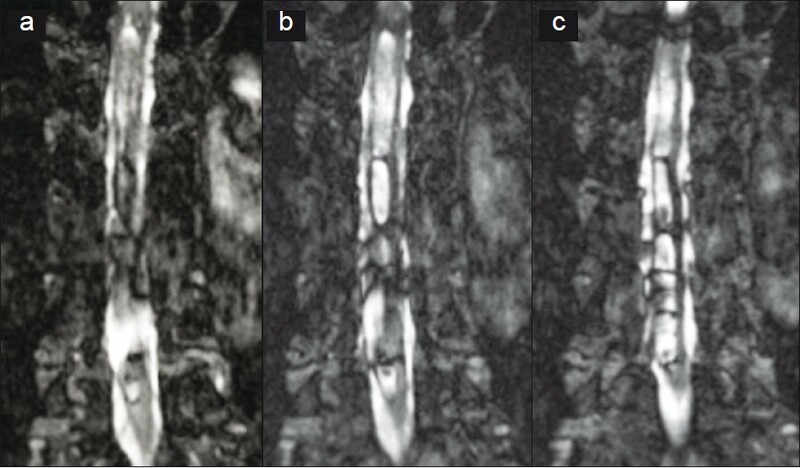 In the evaluation of syringomyelia, unlike conventional T2-weighted MR imaging, CISS imaging and myelographic MRI with TrueFISP can detect nerve root details, neural tethering, subarachnoid adhesions, or cavitation in the syrinx, allowing a significantly higher rate of detection of focal adhesive arachnoiditis and enabling the surgeon to accurately identify cases that require surgical treatment for obstructed CSF. Microsurgical arachnoidolysis appears to be a straightforward method for mobilizing the spinal cord and reconstructing the CSF pathway, though the surgical procedure is technically demanding and challenging. It is conceivable that microsurgical arachnoid dissection can be used in focal arachnoiditis with possible favorable outcomes on imaging as well as in terms of neurological function, although surgery of longitudinally extensive arachnoiditis needs to be further explored. There are certain important considerations if a satisfactory outcome is to be achieved. First, cutting the dentate ligament and the arachnoid membrane rostral and caudal to the lesion is desirable before starting meticulous arachnoidolysis of the adhesions. Second, the dorsal surface of the spinal cord around the lesion should never be dissected because the spinal cord segment around the lesion may be fragile and easily damaged by the surgical manipulation. Third, the spinal cord should be mobilized as much as possible, with restoration of the CSF pathway. Finally, the surgical field should be clean and bloodless to avoid retethering of the spinal cord long after the microsurgical arachnoidolysis. The CSF pathway can be maintained by a duraplasty using fascia lata, followed by expansive laminoplasty. , Maximal expansion of the CSF pathway needs to be done. The material used for duraplasty is another important factor that determines a long-lasting benefit. Expansive duraplasty with a GORE-TEX® membrane is one possibility. Although a GORE-TEX® membrane has been used to prevent or minimize postoperative readhesion, the neural tissue was bound to a thin neomembrane that surrounded the GORE-TEX® membrane in an experimental study in rats. Dural plasty using autologous fascia lata may be better for reducing the risk of adhesive change long after the surgery. In addition, dural plasty should be stretched and expanded by securing it to the adjacent bone, to maintain the CSF pathway. Diagnosis of focal adhesive arachnoiditis using MRI is critical to determine the surgical indication. CISS imaging or myelographic MR imaging with TrueFISP is helpful for localizing the lesion for surgical exposure. The surgical outcomes in the cases presented are preliminary, but acceptable in the follow-up period. We conclude that microsurgical arachnoidolysis appears to be a straightforward method for stabilizing the progressive symptoms, although the surgical procedure is technically demanding. 1. Barbaro NM, Wilson CB, Gutin PH, Edwards MS. Surgical treatment of syringomyelia. Favorable results with syringoperitoneal shunting. J Neurosurg 1984;61:531-8. 2. Caplan LR, Norohna AB, Amico LL. Syringomyelia and arachnoiditis. J Neurol Neurosurg Psychiatry 1990;53:106-13. 3. Edgar R, Quail P. Progressive post-traumatic cystic and noncystic myelopathy. Br J Neurosurg 1994;8:7-22. 4. Sgouros S, Williams B. A critical appraisal of drainage in syringomyelia. J Neurosurg 1995;82:1-10. 5. Batzdorf U. Primary spinal syringomyelia. J Neurosurg Spine 2005;3:429-35. 6. Klekamp J, Batzdore U, Samii M, Bothe HW. Treatment of syringomyelia associated with arachnoid scarring caused by arachnoiditis or trauma. J Neurosurg 1997;86:233-40. 7. Batzdorf U, Klekamp J, Johnson JP. A critical appraisal of syrinx cavity shunting procedures. J Neurosurg 1998;89:382-8. 8. McCormick PC, Torres R, Post KD, Stein BM. Intramedullary ependymoma of the spinal cord. J Neurosurg 1990;72:523-32. 9. Goto T, Ohata K, Takami T, Nishikawa M, Tsuyuguchi N, Morino M, et al. Hydroxyapatite laminar spacers and titanium miniplates in cervical laminoplasty. J Neurosurg 2002;97:323-9. 10. Takami T, Ohata K, Goto T, Nishikawa M, Nishio A, Tsuyuguchi N, et al. Lift-up Laminoplasty for myelopathy caused by ossification of the posterior longitudinal ligament of the cervical spine. Neurol India 2004;52:59-63. 11. Alvisi C, Cerisoli M. Long-term results of the surgical treatment of syringohydromyelia. Acta Neurochir (Wien) 1984;71:133-40. 12. Cho KH, Iwasaki Y, Imamura H, Hida K, Abe H. Experimental model of posttraumatic syringomyelia: the role of adhesive arachnoiditis in syrinx formation. J Neurosurg 1994;80:133-9. 13. Morikawa T, Takami T, Tsuyuguchi N, Sakamoto H, Ohata K, Hara M. The role of spinal tissue scarring in the pathogenesis of progressive post-traumatic myelomalacia. Neurol Res 2006;28:802-6. 14. Ohata K, Gotoh T, Matsusaka Y, Morino M, Tsuyuguchi N, Sheikh B, et al. Surgical management of syringomyelia associated with spinal adhesive arachnoiditis. J Clin Neurosci 2001;8:40-2. 15. Peerless SJ, Durward QJ. Management of syringomyelia: a pathophysiological approach. Clin Neurosurg 1983;30:531-76. 16. Roser F, Ebner FH, Danz S, Riether F, Ritz R, Dietz K, et al. Three-dimensional constructive interference in steady-state magnetic resonance in syringomyelia: advantages over conventional imaging. J Neurosurg Spine 2008;8:429-35. 17. Tator CH, Meguro K, Rowed DW. Favorable results with syringosubarachnoid shunts for treatment of syringomyelia. J Neurosurg 1982;56:517-23. 18. Vernon JD, Silver JR, Symon L. Post-traumatic syringomyelia: the results of surgery. Paraplegia 1997;14:245-50. 19. Williams B, Page N. Surgical treatment of syringomyelia with syringopleural shunting. Br J Neurosurg 1987;1:63-80. 20. Brodbelt AR, Stoodley M. Syringomyelia and the arachnoid web. Acta Neurochir (Wien) 2003;145:707-11. 21. Brodbelt AR, Stoodley M, Watling A, Tu J, Burke S, Jones NR. Altered subarachnoid space compliance and fluid flow in an animal model of posttraumatic syringomyelia. Spine (Phila Pa 1976) 2003;28:413-9. 22. Brodbelt AR, Stoodley M, Watling A, Tu J, Jones NR. Fluid flow in an animal model of post-traumatic syringomyelia. Eur Spine J 2003;12:300-6. 23. Milhorat T, Capocelli A, Anzil A, Kotzen RM, Milhorat RH. Pathological basis of spinal cord cavitation in syringomyelia: analysis of 105 autopsy cases. J Neurosurg 1995;82:802-12. 24. Casselman JW, Kuhweide R, Deimling M, Ampe W, Dehaene I, Meeus L. Constructive interference in steady state-3DFT MR imaging of the inner ear and cerebellopontine angle. AJNR Am J Neuroradiol 1993;14:47-57. 25. Laitt RD, Mallucci CL, Jaspan T, McConachie NS, Vloeberghs M, Punt J. Constructive interference in steady-state 3D Fourier-transform MRI in the management of hydrocephalus and thirdventriculostomy. Neuroradiology 1999;41:117-23. 26. van Ouwerkerk WJ, Strijers RL, Barkhof F, Umans U, Vandertop WP. Detection of root avulsion in the dominant C7 obstetric brachial plexus lesion: experience with three-dimensional constructive interference in steady-state magnetic resonance imaging and electrophysiology. Neurosurgery 2005;57:930-40. 27. Yousry I, Moriggl B, Schmid UD, Naidich TP, Yousry TA. Trigeminal ganglion and its divisions: detailed anatomic MR imaging with contrast-enhanced 3D constructive interference in the steady state sequences. AJNR Am J Neuroradiol 2005;26:1128-35. 28. Baskaran V, Pereles FS, Russell EJ, Georganos SA, Shaibani A, Spero KA, et al. Myelographic MR imaging of the cervical spine with a 3D true fast imaging with steady-state precession technique: Initial experience. Radiology 2003;227:585-92. 29. Adelstein LJ. The surgical treatment of syringomyelia. Am J Surg 1938;40:384-95. 30. Rossier AB, Foo D, Shillito J, Dyro FM. Posttraumatic cervical syringomyelia. Incidence, clinical presentation, electrophysiological studies, syrinx protein and results of conservative and operative treatment. Brain 1985;108:439-61. 31. Suzuki M, Davis C, Symon L, Gentili F. Syringoperitoneal shunt for treatment of cord cavitation. J Neurol Neurosurg Psychiatry 1995;48:620-7. 32. Park YK, Tator CH. Prevention of arachnoiditis and post-operative tethering of the spinal cord with Gore-Tex surgical membrane: an experimental study with rats. Neurosurgery 1998;42:813-23.